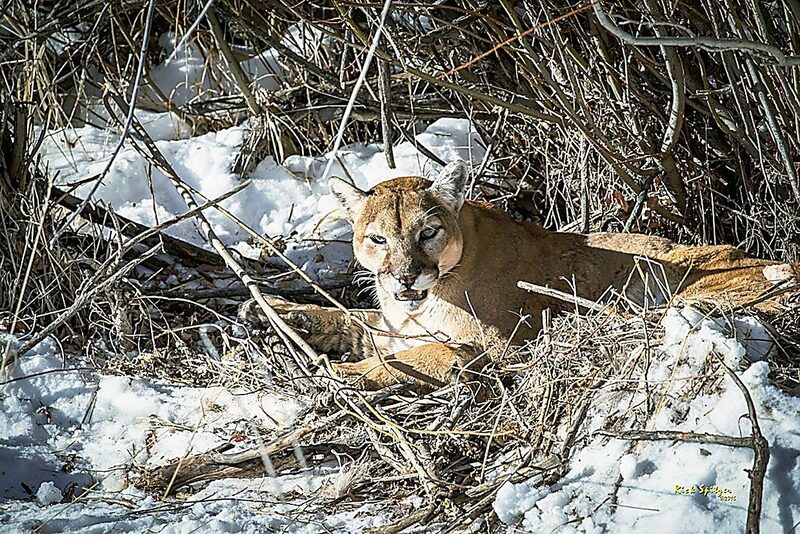 This mountain lion was spotted in Edwards this past winter. SILT — The police department is encouraging residents to be alert following a “probable” mountain lion attack on a deer Sunday. A resident living in the eastern rural part of town came home Sunday night to find a dead deer in his fenced-in backyard, Silt Police Chief Levy Burris said. A police officer observed what Burris said were “pretty definitive claw marks and bite marks to the throat” of the deer, indicating a lion attack. There have been lion sightings reported over the past several months along Peach Valley Road about 3 miles east of town, according to Burris. “Three miles is not a long distance for any animal … to travel,” he said. The Silt department put a call in to Colorado Parks and Wildlife to try and get a definitive ruling, but a wildlife officer was unavailable at the time. CPW’s officers tend to be flooded with calls over the summer involving actual wildlife sightings, including lions, bears and other animals, said Mike Porras, public information officer for CPW’s northwest region. Porras was unaware of the incident and the recent lion sightings in the area, but he said it can be difficult to definitively link such an incident to lion activity without an actual sighting or tracks. “If there were no tracks, no witnesses, no visual information, it would be difficult to determine if it was a lion without a real close inspection of the carcass,” Porras said. Unless the lion is a juvenile, it seems unlikely that a deer would escape a lion, which are adept at killing deer. “If it had been a lion it would have snapped its neck and carried it off immediately,” Porras said. The Silt officer who responded to the incident has lived in rural areas and is familiar with mountain lion attacks, Burris said. Based on a blood trail, it appears the deer escaped the attack, then jumped a fence into the backyard, Burris said. But it was too weak to jump over the other side of the fence farther away. Lions do prey on deer, so if there are deer in an area it is not unusual for lions to be nearby, Porras said. “We have lions in Colorado, they eat deer and if deer are in your neighborhood or in your area it’s likely lions are not far away,” he said. Burris recommended residents be mindful of the potential lion presence, much like residents in other areas that regularly encounter large predators such as bears. Further, Porras reminded residents to avoid feeding wildlife at all times. Feeding or trying to care for deer and other animals often attracts larger predators. “You want wildlife to remain in the wild, not in your residential neighborhoods,” he said. Anyone who sees a mountain lion in a residential area should call the local CPW office.